The idea that performing Shakespeare can help in the treatment of prisoners, ex-offenders and those suffering mental illnesses has been gaining popularity for several decades. Actors have often lead the way, with both Mark Rylance and Ian McKellen working actively with offenders. One of the best-known organisations working in this area is the USA’s Shakespeare Behind Bars, The work is expensive, costing $500 per person, and the charity needs constant support. This week I’ve been told about another actor’s efforts to raise money for this good cause. New York actor Sarah Eismann is crowdfunding, but no sponsored walks for her: she is carrying out at least 40 miles of Open Water Swimming, giving her project the title Swimming for Shakespeare. As well as raising money, Sarah hopes to raise awareness of the work done by Shakespeare Behind Bars and other similar programmes. Should you wish to donate, this is the link to Swimming for Shakespeare. 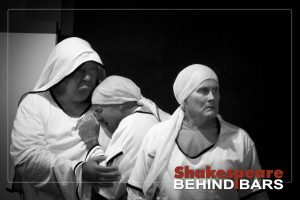 Shakespeare Behind Bars was founded in the USA in 1992, and is holding a conference on Shakespeare in Prisons at the San Diego Globe in March 2018. It’s expected that 150 people will attend the conference. The following description appeared in the article announcing it that appeared in the San Diego Tribune: “The biennial Shakespeare in Prisons Conference gives prison arts practitioners the opportunity to share their collective experiences, rejuvenate passion for their work, and build an expanded network of peers. Artists and educators engaged in transformational arts programs using Shakespeare in prisons across the U.S. (and the world) are brought together to explore and study the effects such programming has on prison populations. Shakespeare Behind Bars is just one of many similar organisations, and holding these biennial conferences shows how seriously this kind of therapy is now taken. This link leads to another, the Shakespeare Prison Project at the University of Wisconsin. In the UK too groups such as Not Shut Up works with offenders through a variety of arts experiences, including Shakespeare. I first became aware of the work being done to treat offenders by introducing them to Shakespeare when members of the RSC went to Broadmoor Hospital, England’s best-known high-security psychiatric hospital. Most of the patients have been convicted of serious crimes. 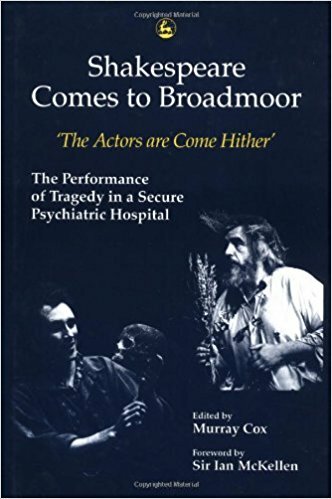 Murray Cox, consultant psychotherapist at Broadmoor, met Mark Rylance who was playing a disturbed Hamlet at the RSC in Stratford in 1989, and their meeting led to the actors performing the play to patients at Broadmoor. Cox tells the story of the connections that followed in his 1992 book Shakespeare Comes to Broadmoor. There is an interview with Mark Rylance here and an essay by Ian McKellen who wrote the foreword to the book here. Part of the book itself can be read online here. When Murray Cox died in 1997 he was still working at Broadmoor. Initially companies performed whole plays including Hamlet, Romeo and Juliet and Measure for Measure, to patients and staff, but they were also able to take part in workshops and discussions. Many of the projects now encourage participants to put on a production of a whole play, and a number of different conditions are now thought to be helped. This link leads to an article about another therapy that helps to treat children with autism spectrum disorder, developed over a number of years by RSC actor Kelly Hunter. She uses a series of games based on themes from The Tempest to boost social skills. More research is needed but the results so far are striking. It would be interesting to know what Dr John Conolly would have made of these projects. He was a physician in Stratford-upon-Avon during the 1820s who became the driving force behind the newly-established Shakespeare Club. His real passion was in treating the mentally ill and this led him in 1839 to become Superintendent of the Hanwell Asylum in Middlesex. Here he developed techniques of treating mentally ill patients by humane methods. Working with mentally ill patients for several decades he developed his own theories about Shakespeare’s knowledge of the subject, publishing his book A Study of Hamlet in 1863. This entry was posted in Legacy and tagged Ian McKellen, John Conolly, Kelly Hunter, Mark Rylance, mental illness, Murray Cox, Not Shut Up, prison, Shakespeare Behind Bars, Shakespeare Comes to Broadmoor, Swimming for Shakespeare. Bookmark the permalink.